About 13 percent of Medicare beneficiaries age 65 and older need LTSS due to an inability to perform two or more activities of daily living or severe cognitive impairment. This need for LTSS is emerging as a defining characteristic of the high-cost, high-need Medicare population. 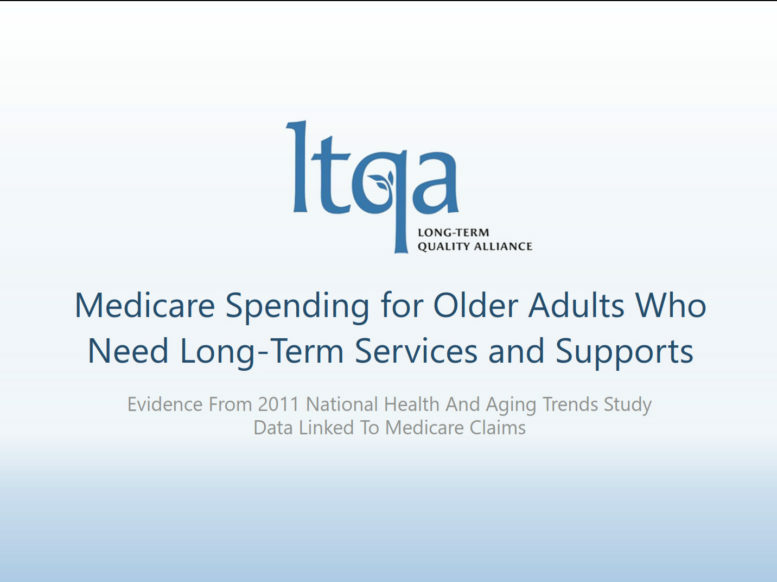 In this new Research Brief, LTQA and Johns Hopkins University researchers analyze the 2011 National Health and Aging Trends Study survey data linked to Medicare claims, and find that Medicare spends nearly three times as much per capita on the 13 percent of older adults who need LTSS as on the remaining 87 percent of older beneficiaries without such needs. In fact, the need for LTSS remains associated with high Medicare spending even when controlling for other characteristics, such as having chronic conditions or being dually-eligible for Medicare and Medicaid. This research suggests that policy efforts to reduce healthcare spending would be enhanced by addressing the needs of the LTSS population, regardless of whether the LTSS is financed by Medicaid, out-of-pocket savings, or provided by unpaid family caregivers.